You are here: Home / Our Blog / Helpful Resources / What Are Items That Show Up On A Title? There are many documents that a buyer will be shown during the closing process, all designed to disclose important information about the property. Of all these documents, the title is certainly one of the most significant. This essential report details many different things including anything recorded against the home (like easements, encroachments, or liens), as well vesting and ownership. The preliminary title report will also disclose the results of the county records search that the St George UT title company will have performed to validate the issuance of title insurance. It will also list as exceptions any liens that are held against the property, if applicable. 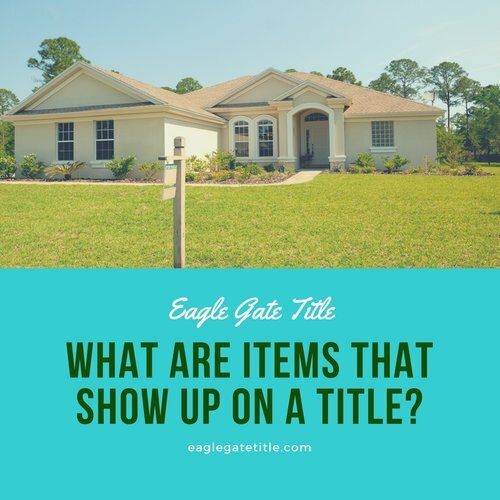 There are three items on a preliminary title report that typically merit the closest review, however. Those are the legal description, taxes, and mortgage liens. The property’s location and boundaries are provided here in precise and descriptive detail by the St George UT title company, particularly in relation to intersections and streets nearby (advertising or marketing distributed by real estate agents don’t typically include this information). The legal description will also include other details on the property’s interests such as storage or parking that conveys within the property or easements (exclusive or nonexclusive). Here is an example: “Beginning at a point on the Easterly line of Gardenia Street, distant thereon 300 feet Northerly from the Northerly line of Crescent Road; running thence Northerly along the Easterly line of Dickson Boulevard 30 feet; thence at a right angle Easterly 200 feet,” etc. The primary lien on a title report will always be property taxes. This is because if there are any unresolved property taxes associated with the property of interest, a new person cannot take ownership. A property cannot be transferred in this scenario. A debt holder cannot get paid until a settlement on the taxes is completed. In most cases, if you look right underneath property taxes on the preliminary title report provided by your St George UT title company you’ll see mortgage liens listed, and they’ll be listed in descending order (1st, 2nd…) beginning with the largest. These liens have to be paid in the order they appear on the preliminary title report upon closing. You’ve probably heard of a short sale. This is where it gets its name. The lender (or lenders) agrees to receive less than the amount owed (shorted) as the sale itself will not produce enough money take care of all the lien holders and property taxes in full. An easement is “a right to cross or otherwise use someone else’s land for a specified purpose”. 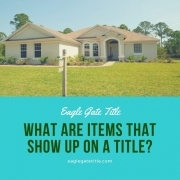 If another person has an easement on the property of interest, the title report will show it. Unless both parties come to an agreement to remove the easement, it will stay on the report. If needed, a review of the original easement agreement can be performed by the St George UT title company. This stands for covenants, conditions, and restrictions which can be recorded against the property in some cases. Buyers are required to follow all rules set forth by a CC&R. These are almost always applicable if the St George title company is dealing with any type of developed subdivision. Perhaps the property is in a historical district and, as a result, is subject to additional and perhaps out-of-the-ordinary restrictions and rules such as requiring the new owner to changes the house’s facade, for example. The St George UT title company will inform the buyer if this applies in the title report. http://eaglegatetitle.com/wp-content/uploads/2019/02/st-george-ut-title-company.jpg 500 500 aloha http://eaglegatetitle.com/wp-content/uploads/2019/02/logo-300x212.png aloha2019-02-26 16:56:492019-02-27 19:25:48What Are Items That Show Up On A Title?